Fundraising is one of my least favorite things to do. I never liked fundraisers when it came to my kid’s activities and I like like it even less for ministry. It’s not that I don’t think my children’s programs or women’s ministry causes are valuable, but honestly, fundraisers are very taxing and tiring. Don’t you agree? Fundraisers will work you to death! The only group in our church that raises money is our women’s mission’s support group whom has always sponsored an annual craft fair and a booth at our town’s yearly strawberry festival. Let me tell you – these women know how to have fun fundraising! 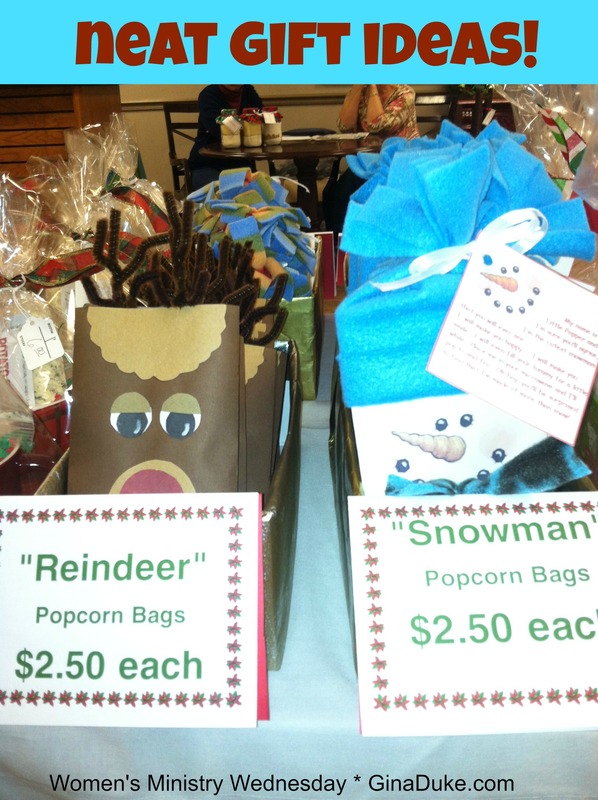 In case you host craft fairs or bazaars, I thought I would share some of the items that our ladies sold this year for about a total of $8,000.00. Now that’s a lot of moola for missions work! 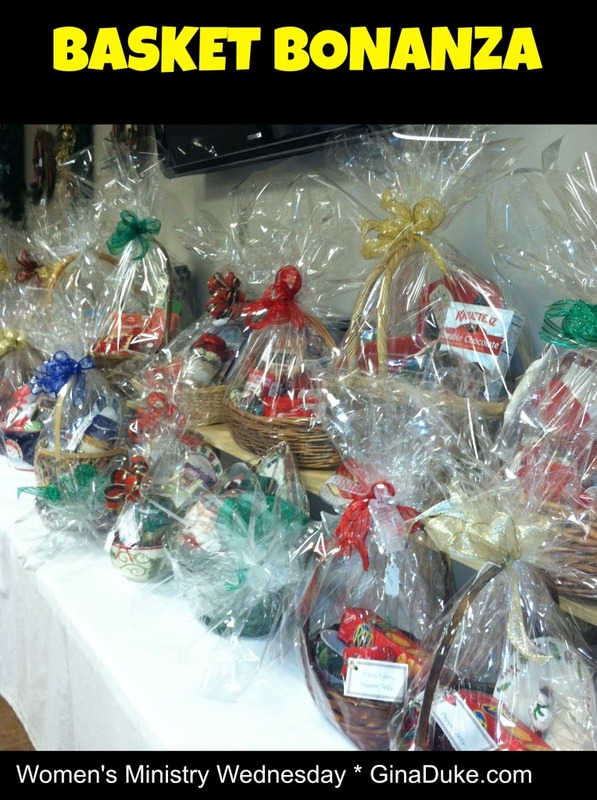 Gift baskets are our biggest sellers. They are packed with snacks and decorative holiday dishware. I think people like them because they are ready to give away. They look nice and you don’t have to do wrap them. The key is to make plenty of them. The women who create our baskets are pros. 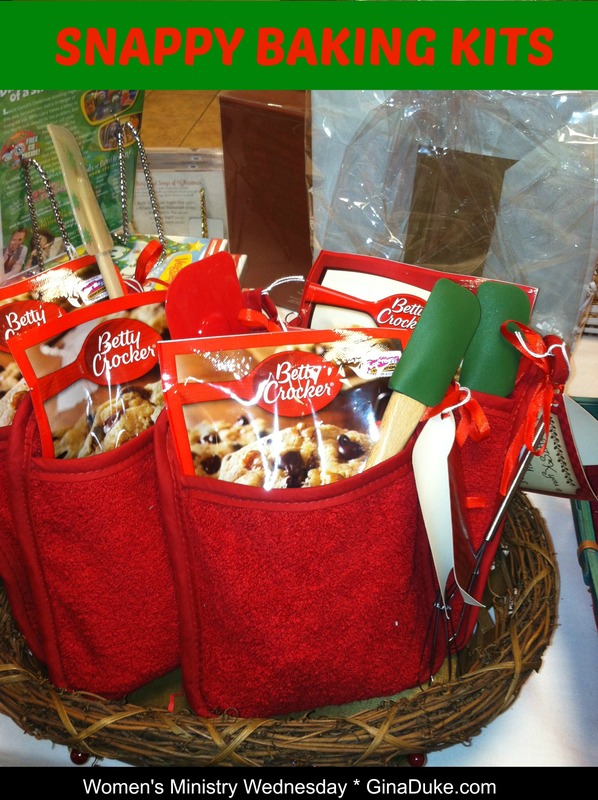 They literally benchmark other baskets at other craft fairs and then shop all year, looking for just the right items to include in the holiday gift baskets. Teaming passions with needed fundraising items makes a fun initiative. Who doesn’t love home-made jellies, jams, pickles, relishes, salsa’s and canned vegetables? If your church is like mine, then you will probably have plenty of donors of these products. Most of our donors are our senior adults, but our younger women want to learn this craft, too. 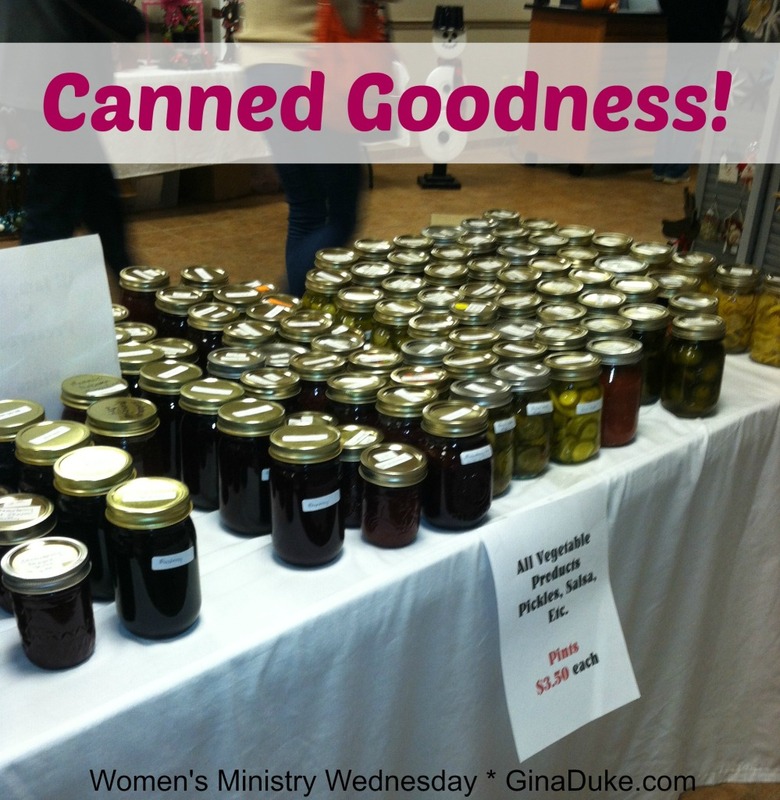 Consider hosting canning events where the women can choose to donate some of their canned goods when they are done. Easy money!!! Another favorite item is the wood Christmas decor. The snowmen and reindeer sets go quick. We sell them in sets of threes. This is a great way to get the men involved. Some of our guys are serious about making some reindeer! This has turned out to be a great couples project for some. You will always do well when you have popular products to sell. Right now, many love decorating skids. 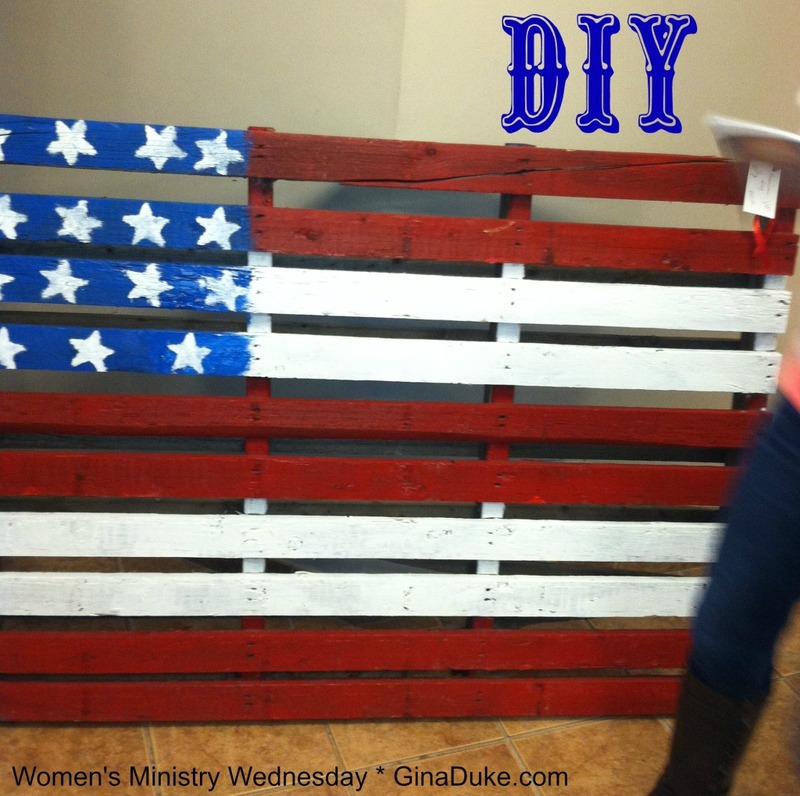 It’s fun finding ideas on Pinterest and sharing them at the fair. People will pay a good price for items such as these, too! 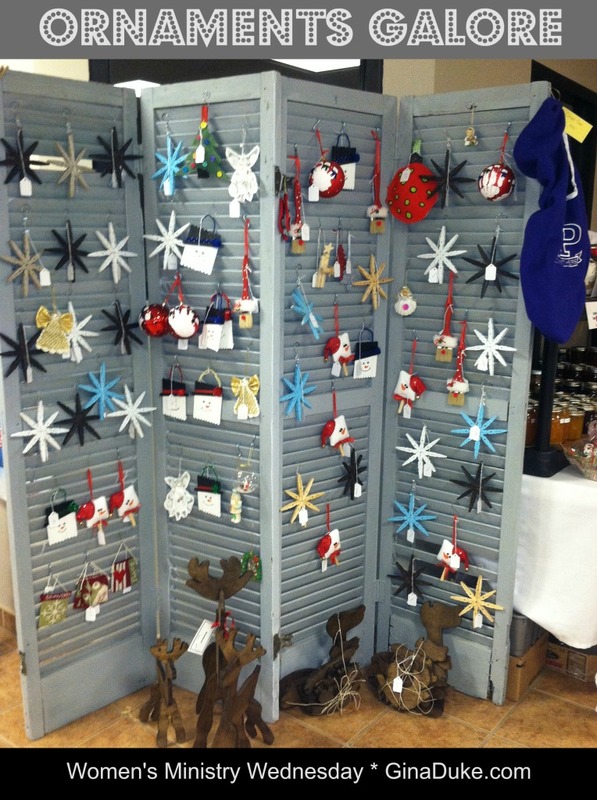 It’s not just having ornaments to sell, but how you display them that matters!!! 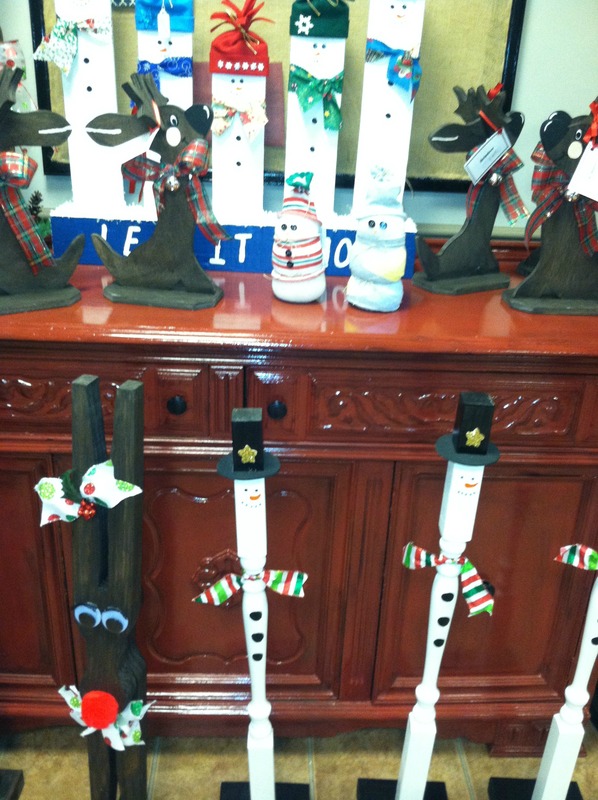 Who can resist being drawn to this ornament display and buying one??? One year, a bunch of us got together to make the ornaments, which turned into a great night of fun. Items such as these are easy to put together. We occasionally plan “work nights” where we set up assembly lines to put together items such as these baking kits and cookie ingredients in jars. Even though we work hard, we still manage to joke around and have fun. These microwave popcorn packages in gift covers are my favorite this year! Make sure to include small items that anyone can buy and will want to buy. These make great teacher and friends’ gifts for your kids. Whenever you can create neat gifts that are holiday specific, it makes the event so much more festive! What about giving awards away for best new items introduced??? And you cannot forget about wreaths! Holiday wreaths! 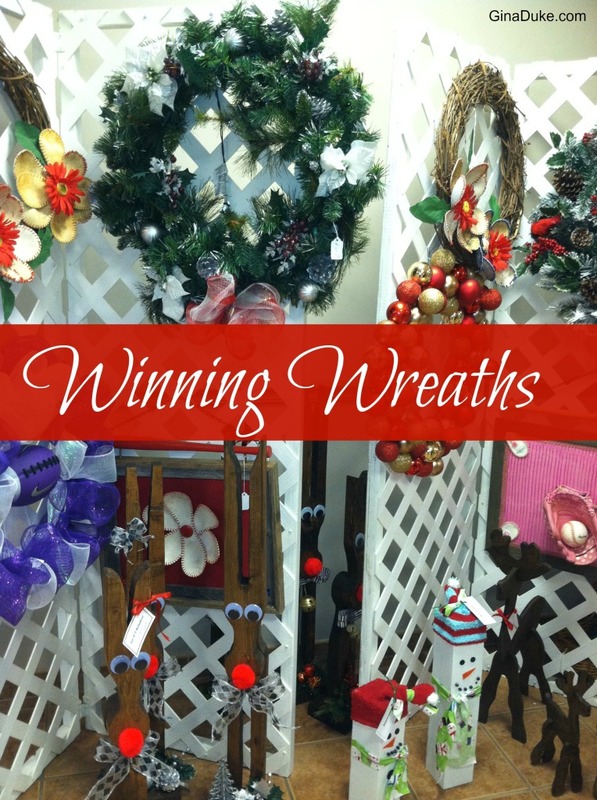 Sports Wreaths! Team Wreaths! These wreaths will sell like hotcakes! Oh, and don’t forget about burlap wreaths! Consider having a wreath making party. Other top sellers are hand-made quilts. I don’t have a picture of one because they really did sell like hotcakes. We also have a church member who owns a specialty shop, and has graciously donated some nice items from her clearance tables. Now, that’s fun! We are like kids in a candy store. Perhaps, you too, have some untapped resources for your fundraiser??? However you do it, the key is to keep it fun. 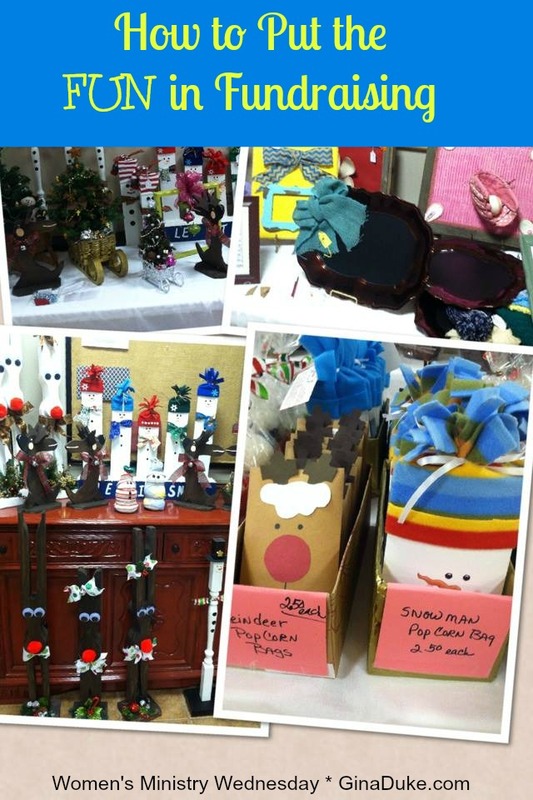 In case you are wondering how we cleared $8,000 with our craft fair...Well, besides having awesome items to sell as previously discussed, we set our craft fair up in a high traffic area of our church (we’ve done this previously in our fellowship hall, too) for three weeks in November. We also take everything over to our town’s local craft fair event for one Saturday. While the craft fair is set up at church, people can stop by and shop anytime during the day while our office staff is there. And because we also have a lot of walkers using our walking track, as well as other events being held at our church through the week, we are able to sell a lot of items. That’s how we do it. So, what are some of your best fundraising ideas? I would love to hear about them! Please share in the comments section below. P. S. Because the November give-away was so successful, I decided that I would do another one in December, but with a little twist; I am going to up the ante this time. This drawing will be for my blog subscribers. If you are not a subscriber, you can become one here.This will be another 5-book give-away, plus one more special give-away for the subscriber who most creatively promotes Organizing Your Prayer Closet. Just email me with details of all the different ways you promoted my book, and my ministry board and I will name a winner on December 20th. Whomever does the most and is the most creative will win this really cool ASK cross necklace (valued at $38) with a copy of my book! 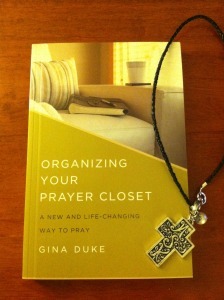 Mention Organizing Your Prayer Closet in your Facebook posts. Write an online book review of my book for Amazon or Barnes & Noble, etc. Write a blog post about it. Hey, Women’s Ministry Leaders/Directors/Team Members! Check out this MUST-FOLLOW Pinterest Board featuring bloggers who write about tips, strategies and ideas for Women’s Ministry! Be sure to follow it to stay on top of the latest posts!!! 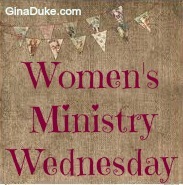 Follow Gina Duke / Churchtown Ministries’s board Must-Follow Women’s Ministry Leaders on Pinterest. This week I am linking up with HolleyGerth.com, ChristianMommyBlogger, and FaithAlongtheWay. Check out this page for a full view of all of my preferred blog parties. Award-winning author Gina Duke is a wife, mom and the Director of Women’s Ministry at her local church. With a B.S. in Organizational Leadership, she is able to bring a clear word for authentic Christian living. Through her book, “Organizing Your Prayer Closet: A New and Life-Changing Way to Pray” (Abingdon Press), she imparts 1 Peter 4:7 with the gift of structured prayer journaling. You may also follow her on Twitter and Instagram @TheGinaDuke.